"Insanely rich but so crunchy and good. Any chocolate lover will enjoy these!" In a medium heat-proof bowl, melt together the chocolate chips and condensed milk in the microwave. If you do not have a microwave, use a metal bowl over the top of a pan of simmering water. Stir frequently until melted and smooth. Stir in the peanuts and rice cereal until well blended. Drop by rounded spoonfuls onto waxed paper. Chill 2 hours to set. Wonderful! Easy! Yummy! 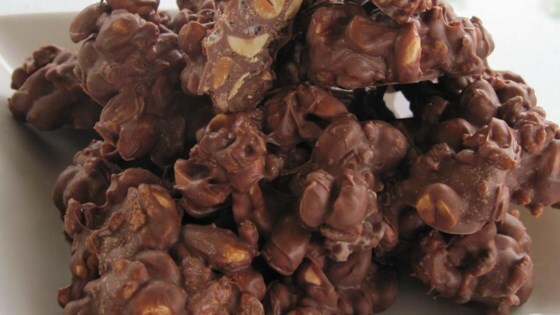 I often add 2/3 cup of rasins as well and it tastes similar to a Chunky or a Fruit & Nut Bar. Many Thanks!